Holy schmoley…this here’s some world-class chocolate! It would be criminal not to share this information with chocolate chip lovers everywhere. These really rocked my world. Bake them into cookies, mix them into brownies, or eat them straight out of the bag, but you have to try them. They are that good. I’m a dark chocolate gal, and these babies are right up my alley…not too sweet, but not bitter at all. I would rate them a 99.9 out of 100, five out of five stars, two giant thumbs up, and an enthusiastic “hell, yeah!” I’m not a fanatic chocoholic, but I am a huge fan of these chocolate chips. They’re just better than all the others. I swear on a stack of cookbooks. I would never joke about chocolate. Ever. My favorite chocolate chips used to be the American standard – Nestle Toll House semi-sweets. It’s what I grew up on. It’s probably what most of us grew up on. Then I discovered Ghirardelli semi-sweet chips, and they became my new favorite for the past few years. 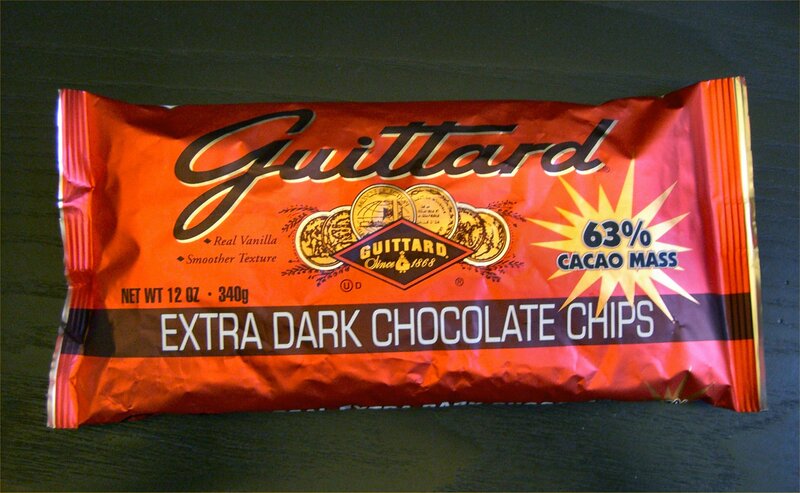 This February, I stumbled onto a grocery store clearance rack and found Guittard extra-dark chocolate chips. They were marked down to 99 cents a bag (post-Christmas), which was more than I could resist. I grabbed 6 bags and for 99 cents each, I felt like I was stealing them. Now I wish I’d bought them all. I should have bought them all. I had no idea they would be life changing. Or that they would all be gone the next day. Or that I would dream of chocolate chip cookies (not usually my favorite). Or that I would struggle with the compulsion to eat them straight out of the bag. For me, that’s the mark of a great chocolate chip. If I can eat them plain right out of the palm of my hand and be completely satisfied, it’s a winner. I could put these in a bowl and eat them with a spoon (hypothetically, of course…wink, wink). If you’re a chocolate lover, get to your store and pick up some Guittard chocolate chips as soon as you can. Run if you have to. If you don’t love them, I’ll be stunned. Then I’ll probably e-mail to ask if you have a cold and your taste buds are impaired. If your store doesn’t carry them, go straight to the manager and ask for them. Don’t take no for an answer. I’d throw around the idea of a hunger strike, but who on earth could pull that off in a grocery store? I’d be sneaking Bugles and Ding Dongs or green olives and Guittard chocolate chips after the lights went out. I’d make a terrible hunger striker. I have no will power, which explains my love for chocolate chips. Man, I could use a cookie right now. Disclaimer: NanaBread is not an employee of Guittard or any other chocolate company, which she deeply laments. In fact, she’s not an employee of any company right now, which The Complete Package deeply laments (hi, honey). While she would make an excellent chocolate taste-tester, travel show host or personal shopper, she has never been approached by any company to promote any product known to man or beast. She is simply an opinionated Texan who feels compelled to share her innermost thoughts with her readers. End of story. Can I steal your disclaimer??? It’s hilarious. Oh, and where would one find these chocolates? I have never seen them before… And can I just tell you what my evil girlfriend gave me today as a birthday gift??? Um, yeah, peanut butter-chocolate chip-pretzel cookies. DARK chocolate chips!!! Evil. Have mercy! I need an evil girlfriend! My daughter (I refer to her as My Baby in the blog) bought those little Snyder’s pretzel & peanut butter sandwiches, then dipped them in dark chocolate for our annual Hoegarden weeekend this year. I couldn’t put them down. If I ate one, I ate 50. It was sick! Your friend definitely sounds evil….deliciously evil. I buy Guittard chips at HEB. It’s a local Texas grocery chain (and I love it with all my heart). I’d offer to mail some to you so you can try them, but they wouldn’t make it to the post office with our heat. I can’t even get wine shipped to my house. Nobody ships the good stuff to South Hades. Dang it. And happy birthday! OK, now I expect to see something at Thankmas with these babies in them, on them or out of them!! Tell HEB they need to build a store in far north TX!!!! I’ll see what I can do. Just found a recipe for chocolate cheesecake brownies at http://www.evilshenanigans.com/2010/08/chocolate-cheesecake-brownies/ Evil Shenanigans, indeed! Check her out…she’s a fellow Texan. I’m thinking these brownies may need to make an appearance at Hoegarden 2011. Right? Yeeaahh, baby!! I say that’s a 10-4, you betcha’, just do it kind of recipe. Do we have to wait till Hoegarden? I found the same chocolate chip on clearance after Christmas and fell in love with them . I made fudge. All my family wants more fudge, it’s smooooth and creamy. I moved to MO. and NOBODY knows what I’m talking about. Yeah, I know what you mean about having trouble finding them. My mom and sisters actually went to my local grocery store when they came to visit just so they could stock up on Guittard chips in all flavors. They live in Dallas, Tulsa and eastern Oklahoma (Muldrow), and they can’t find them there, either. Surely someone sells them online. I’d be lost, or at least depressed, without my Guittard extra-dark chips. They complete me.